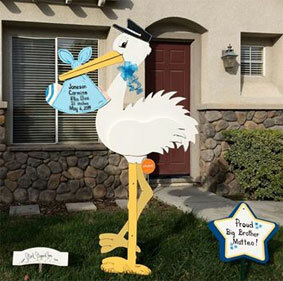 Birth Stork Rental -Announce baby's arrival in style. Storkie stepped out on the town again and attended the Springer Elementary School Silent Auction on Saturday night (2/27/10). Stork Stopped Here donated a stork rental package which was auctioned off to raise money for Patti’s favorite Los Altos Elementary School! Glad we could help. Philanthropists Jillian Manus and Alan Salzman hosted the fifth annual Valentine’s Day Ball at their Atherton residence on Saturday evening, February 6, and the Stork Stopped Here was invited to participate in the festivities. 100% of the evening’s proceeds directly benefit the Stanford Cancer Center. Stork Stopped Here was proud to participate! Visit StorkStoppedHere.com’s profile on Pinterest. © 2019 Birth Storks. Built using WordPress and OnePage Express Theme.